I admit the headline of this post surprises me! I wasn’t expecting to type it. The story goes as follows…. Douvall’s is a company set up by a woman called Alicia Douvall. She’s an ex glamour model and best known in the UK for having a LOT of plastic surgery – over 100 operations at a cost of £1 million plus – and possibly best known to US readers as having a relationship with Dennis Rodman. When I first heard she’d started a skincare range a year or so ago I though ‘oh yes, like so many celebrities do – wonder if she’s even smelt it?’. But then a few weeks ago I was at a trade show. I came across the Douvall’s stand and there, standing on it, was a very tiny woman (and I’m only 5ft4). It was Ms Douvall. I was surprised. This wasn’t a glamorous show like Vitality where teenage girls might come up and coo at her. Nor was it the first ten minutes of the first day when there might be a photographer. This was 20 minutes before closing on the last day of a show for trade buyers. ‘Hmm,’ I thought. ‘Maybe this woman actually believes in what she’s doing.’ We had a chat and I found out a bit more including the fact that she had been out to Morocco and sourced the women’s co-operative who make the oil herself. I went from surprised to impressed. The tricky bit about these encounters then arrived the ‘do you want to try something’ bit. As daft as it might seem for someone who has been testing product for over 20 years, I find actually being asked if I’d like to try a sample really embarrassing. Things called Bronzing Oil were being thrust at me (and that sounded a bit scary) so instead, I just said ‘if I was just going to try one product what would you like it to be?’ A tiny bottle was placed into my hand. ‘Organic Argan Oil Moisturiser’. Yes, I know I’m behind the times jumping onto the Argan Oil bandwagon, but I’d never bothered trying it before. I generally prefer my skincare pumped full of ingredients created by men in white coats that might send my wrinkles back from whence they came. This contains one single ingredient – an oil created by Mother Nature and pressed from the kernel of a desert growing nut. And its skin boosting power comes from Vitamin E, essential fatty acids and some antioxidants. There’s not a test tube in sight – and that makes me nervous. 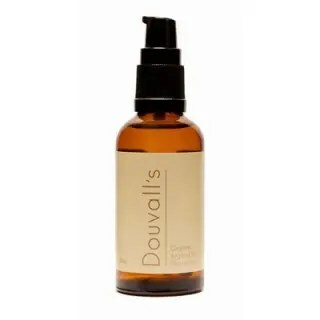 My Verdict on Douvalls Argan Oil. The bottle sat in my ‘to be tested’ pile for a while – I admit, despite my newfound admiration for its CEO I was still looking at it sceptically, then one day I decided I’d try it. That was 10 days ago, I’ve used it every day since. It’s good, very good. It stops my skin feeling dry; it hasn’t brought me out in any spots (new skincare usually does); and even though it does absolutely nothing to remove my wrinkles the fact that it leaves my skin looking shiny and a bit glowy had one of my friends asking me suspiciously the other day ‘what have you had done to your face, you look amazing?’ – when I mentioned the over zealous botox, she said ‘no, I can see that, this is something else.’ The something else is Douvalls Argan Oil. There is one downside. My iPhone hates me. Because I have no patience I invariably slap on moisturiser just before I put on make-up – all of about 60 seconds before I slap on make-up. Powder on top of oil look lovely, but it does make the powder slide off onto your phone at the first opportunity. Sensible people may wish to use it at night, or at least wait a while before applying slap. I never learn and just keep a pile of tissues in my handbag to clean the phone!